(Nanowerk News) Researchers from the University of Southampton have called in to question a 40 year-old theory explaining the periodic speeding up or ‘glitching’ of pulsars. A pulsar is a highly magnetised rotating neutron star formed from the remains of a supernova. It emits a rotating beam of electromagnetic radiation, which can be detected by powerful telescopes when it sweeps past the Earth, rather like observing the beam of a lighthouse from a ship at sea. 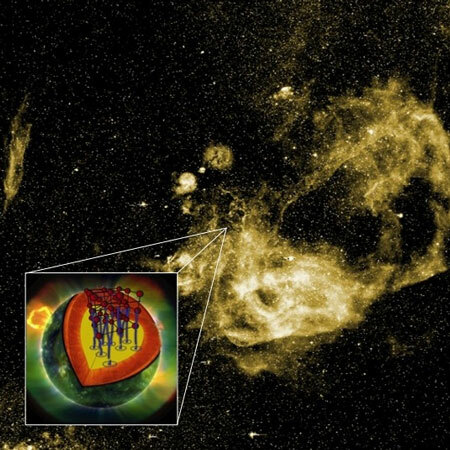 Background: The Vela supernova remnant at optical wavelengths (Credit: CTIO/AURA/NSF), with location of the Vela pulsar indicated. Inset: Artist's impression of the pulsar’s interior, and the interaction between superfluid vortices and the nuclei that make up the star’s crust. Pulsars rotate at extremely stable speeds, but occasionally they speed up in brief events described as ‘glitches’ or ‘spin-ups’. The prevailing theory is that these events arise as a rapidly spinning superfluid within the star transfers rotational energy to the star’s crust, the component that is tracked by observations. However, Southampton academics have used a mathematical model to disprove this. Professor Nils Andersson explains: “Imagine the pulsar as a bowl of soup, with the bowl spinning at one speed and the soup spinning faster. Friction between the surface of the bowl and its contents, the soup, will cause the bowl to speed up. The more soup there is, the faster the bowl will be made to rotate. Professor Andersson and Dr Wynn Ho from the University of Southampton used their calculations, in conjunction with data from radio telescopes and recent results from nuclear physics theory, to challenge current thinking on this subject. The Southampton researchers have written a paper ("Pulsar Glitches: The Crust is not Enough") detailing their theory, produced in collaboration with Kostas Glampedakis at the Universidad de Murcia, Spain and Cristobal Espinoza at the University of Manchester.